Productinformatie "DD Octopus Twin CI - Double CI Slot with 2 Expansionports (CI4All Support)"
Built-in double-CI and 2 ports for expansion modules DuoFlex or CI. 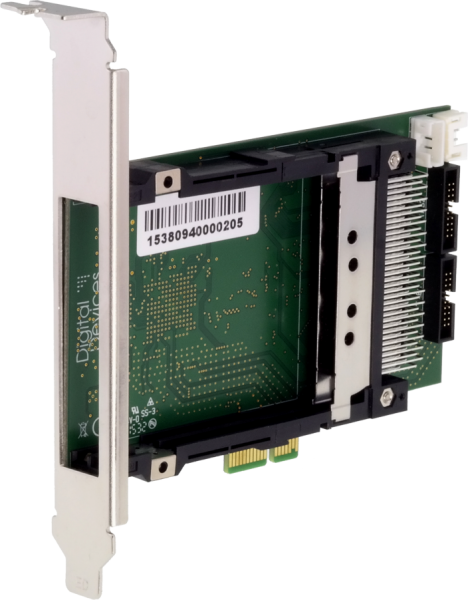 At this PCIe x1 Bridge you can connect up to 2 dual tuners (4 tuners). Mixed operation with CI modules or S2 and CT modules is possible. CI can be used with all other Digital Devices cards (Cine CT / Cine S2, DuoFlex). The connection works over the PCIe bus, assignment is via the Config Tool. No special wiring or electricity required. Verdere links naar "DD Octopus Twin CI - Double CI Slot with 2 Expansionports (CI4All Support)"